The month of October is half over and winter is quickly approaching for many of our members. Some of you will be placing your conversions in storage and starting on planned updates while others in the south and west are still enjoying warm weather and continuing events. That reminds me to mention again that the Great Fan Belt Toss is quickly approaching. A number of our members attend this event and the Registry's Pizza Party. Here's the most recent details for those interested. By popular request, we are now planning to have our annual meeting of the V8 Registry - West Coast Water Pumpers on Saturday, October 27th at 4 pm. The meeting will be at our normal location - The Palm Springs Pizza Hut, which is located at 1180 S Palm Canyon Dr, Palm Springs, CA 92264. As a reminder, we plan to provide food and non-alcoholic beverages to V8 Registry members. Guests are welcome to attend, but get to order their own food and drinks. If you are planning to attend, please respond to this email with an RSVP. This year's CORSA convention was held in Pittsburgh, PA and is listed as one of the most highly attended conventions. 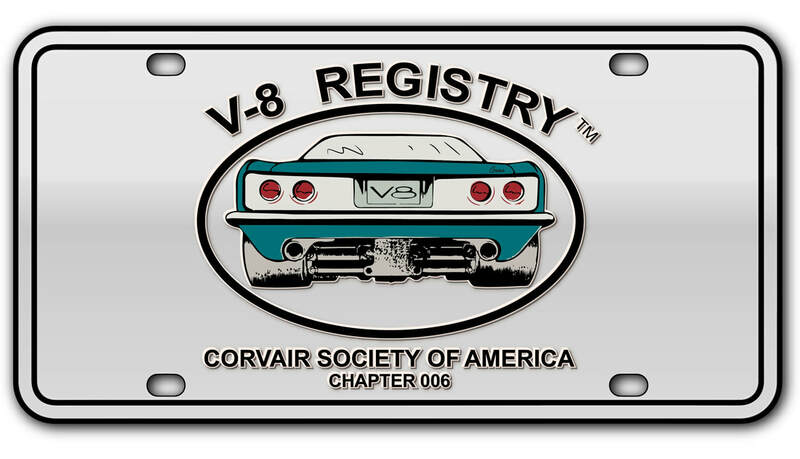 The V-8 Registry had 28 attending members and 10 cars on site. Six conversions participated in the convention autocross. The course was a tight layout, but in spite of that Cory Black won the Don Yenko Award for Fastest Time of the Day. Cory won this award in 2015 at the Knoxville convention. We congratulate him for his achievement as he brings more attention to Corvair Conversions. During the convention, John Black and his wife Claudia hosted a dinner meeting at their home for our members. The event was preceded by a driving tour of the countryside. Pictures can be seen on the website. It was quite a sight to see a caravan of 10 Corvair Conversions. John and Claudia have a beautiful home sitting atop a hill (almost 1000 feet) overlooking the Ohio River. The view was spectacular and everyone enjoyed the meal, comradery and door prizes. The 2019 CORSA Convention is scheduled in St. Charles, IL west of Chicago from July 22-26. If anyone lives in the area and would like to host the Registry Annual Meeting at their home, we are open to helping you with the event. Additional changes have been made to simplify membership for 2019. Rick Andersen, our VP and Webmaster has modified the form and has made it easier to renew your membership with PayPal and to order your 2019 t-shirt. We have established some new rules for 2019 membership. With almost 190 members, it becomes labor intensive to process renewals when members send checks or PayPal payments with no application. In the past either Paul Beck or myself have completed the form for the member. The three officers receive a copy and we each use the applications for their personal Registry files. For 2019 a membership form must accompany your payment. If you don't use a home computer then we recommend that you ask a friend or relative to complete the Membership Form for you if you want to remain a member. Checks and PayPal payments will be returned if the form is not received. We simply don't have the time to complete forms and call to verify the required information. We understand that this policy may cause some members not to renew. We are sorry if this happens, but most members can find someone to help them submit their membership form if they are really interested in maintaining their membership. The first tag issued received the following number: TT001 This tag was issued to Howard Trevor for his father's No. 1 Shop Car. The letters TT are used to honor Ted Trevor. Each year at the CORSA convention, the owner of the most original Crown conversion is honored with the Ted Trevor Award. Russ Brandenburg our Founder is the Senior Judge for the competition. This year we are proud to announce that Howard Trevor was in attendance at the convention and was selected to receive the award honoring his father's contribution to Corvair history. He drove Ted's No. 1 Shop Car from his home in NJ. After all these years, it was a real pleasure to see this historic vehicle participating in convention activities again. We all owe Howard a warm thank you. Scroll to the bottom of the 'CONTACT US' page to upload pictures. Some members have already submitted photos and they have been loaded to your page. Shirts for 2019 will be a medium blue color called Aquatic Blue. The year will appear under the front logo. Please remember to include your size when completing your 2019 membership form if you are ordering a shirt. Often the Registry officers receive email and text messages from members with email addresses that are 'unique' for lack of a better word. The member sending the message doesn't always sign their email or text. This requires that we go back through the membership roster to see who sent the email or text. With 190 members, this becomes time consuming. We ask that you sign your name to all correspondence. If you scroll to the bottom of the 'Members Only' page, you will find a spreadsheet listing all the members with their names grouped by state. This is an easy way to find other members who live close by. At the top of the 'HOME' page there is a button labeled "FIND IT'. Click on this button for short cuts to website features. Near the top right side of the 'HOME' page is another button labeled 'SEARCH'. Click on this button to reveal the search box. Type in one or two key words and you will be amazed at the amount of information that's displayed. https://reddragonautomotive.com/ Bob built race prepared Maserati's in the past and also built a Corvair conversion many years ago. This build incorporates the front and rear C5 suspension components supplied by Dobbertin Performance. The engine scheduled for this build is a LS376/525 crate engine. Drive train components include a C5 differential mated to a BC Saginaw 4-speed transmission. Bob plans to offer video of his build. A video showing the milling of the differential/transmission adapter is available on his website. When completed, Bob plans to offer a kit to members wanting to build their own C5 conversion. He will also build you a rolling chassis or a complete car, your choice. This conversion is expected to be ready by Christmas. Keep an eye on his website for more videos of his progress. Best Wishes to all as fall festivals and the holidays approach.